It might sound like strawberries would stain your teeth, but they have the opposite effect thanks to the malic acid they contain. Before your usual brushing and flossing, mash the berries into a paste and rub them on your teeth. Leave on for five minutes, then rinse, brush, and floss as usual. Or you could try the tastier route and eat them! Just be sure to sink those front teeth right in. Similar to strawberries, apples are brightening due to their high concentration of malic acid. Their crunch also helps remove food particles and scrub your teeth. Pineapple is full of bromelain, an anti-inflammatory and cleansing compound. That translates to healthier gums and a cleaner smile. If that weren’t enough, it’s juicy and delicious. 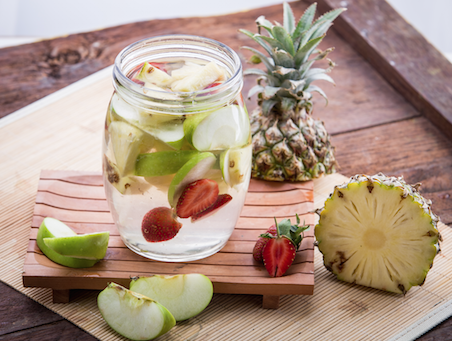 Staying hydrated isn’t just for hot days or athletes. Regularly sipping water, especially after eating, reduces your mouth’s acidity and prevents stains and decay. While not a food you might ingest on its own, baking soda is a staple in most pantries. Not just for baking, this gem is a pro at cleaning and brightening teeth. Simply choose a toothpaste that contains it, or for an extra whitening boost every so often, brush with baking soda right from the box. Lactic acid, found in dairy products, may help protect your teeth and keep them strong. Additionally, the proteins they contain bind to teeth and protect them from harmful acids, keeping them strong, bright, and healthy. If you choose hard cheese, it can also help remove food particles. While regular teeth cleaning at home and the dentist are your main ticket to dental health, any boost you can get is good. These healthy foods are not only great for your body, they’ll help brighten your smile, too. Eat up!